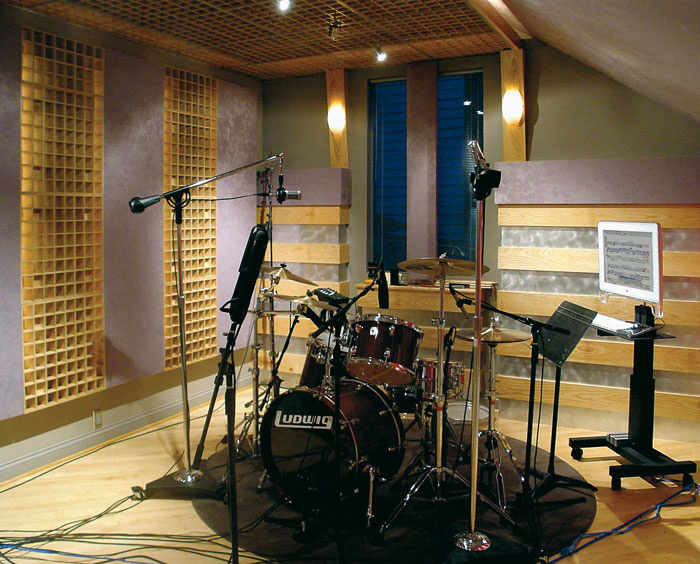 Regular SOS readers will be familiar with Auralex, as we've often used their acoustic foam in the Studio SOS articles. The Space Coupler is a very different product, designed for 'loosely' coupling adjoining acoustic spaces and controlling early reflections. Each acoustic coupler is just under two feet square, which means they slot into many 'T-Bar' standard ceiling systems, though many applications see them fixed directly to walls or ceilings. Physically, the panels look like very shallow, open wine-racks, with a square grid of eight by eight cells. They're made from an attractive wood called Paulownia, that is lighter than pine and looks not unlike a light oak. So, how do these devices work? Unlike foam, which absorbs acoustic energy and consequently reduces the reverberation time, the Space Coupler effectively reduces the intensity of early reflections without taking energy out of the room. However, where some absorption is also desirable, there are foam panels available that sit behind the Space Couplers and protrude into the open 'cells' a little way. Essentially, sound that approaches the Space Couplers square-on passes through the holes more or less unimpeded. As the angle of the approaching sound changes, more diffusion takes places because the incident sound now 'sees' more wood and less open space. With careful placement, and adjustment of the spacing from the surface, the acoustic response can be fine-tuned. This makes them useful on walls and ceilings but, as mentioned at the start of this review, Auralex also recommend the Space Couplers for linking two acoustic spaces so that the reverberation time of the second space can be utilised from within the first, but without over-emphasised early reflections colouring the result. Similarly, the panels can be used directly below ceiling-installed bass traps to combine scattering with low-frequency absorption. Additional advice on using Auralex products in your own room is available from appsupport@auralex.com, and you can get a personalised room analysis form from www.auralex.com/pcf. I tested a SCREEN6 pack (SCREEN apparently stands for Space Coupler Reflective Energy Envelope) in my own studio. The set comprised six Space Couplers and some useful mounting hardware (additional wall-mounting kits are available separately), although in this case I decided to organise my own mounting system. I arranged all six panels as a ceiling 'cloud' and bolted the units together in two groups of three prior to fitting. The wood is very light, so normal threaded drywall fixings were more than adequate to take the weight, even though my studio ceiling is just regular plasterboard. I screwed hooks into the drywall fittings and screwed smaller hooks into the top face of the Space Couplers, then linked the two with metal curtain rings, so that the cloud hung a couple of inches below the ceiling. This left just enough room to slide in the foam panels (I felt I needed the extra absorption). Although my side walls are already fairly well treated, the new cloud of Space Couplers really improved the listening environment without making it sound over-dry. The wood added a bit of life to the sound but the reverb time was significantly shortened by the foam inserts, and the scattering from the wood killed any obvious direct reflections. The whole installation took two of us under three hours. Not only do these panels work for controlling reflections, they also look good. They're not cheap compared with plain foam products, but in the context of what you can easily spend on the rest of your studio the cost seems much more reasonable, and it is always worth spending a small percentage of your budget on making your studio sound good. I don't know of any direct alternative from companies addressing the project studio market, though obviously there are numerous alternatives when it comes to other acoustic products such as foam panels. Easy to fit to walls or ceilings. Can be used with or without foam inserts to control acoustics without choking the life out of the room. Easy to remove if you move studios. Auralex give free advice on using their products. Some basic DIY skills needed for fitting. The Space Couplers are a welcome addition to the Auralex range and perfectly match their wooden Space Array diffusor panels allowing for a mix and match approach.